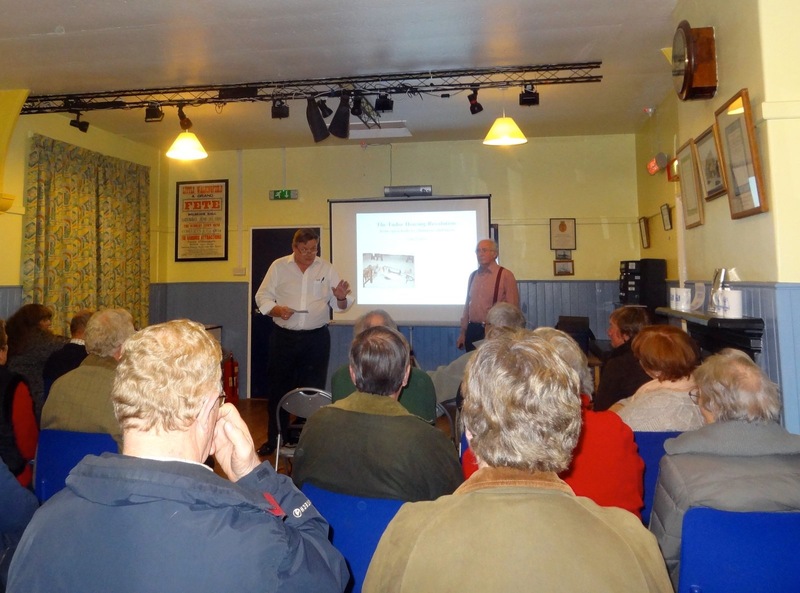 Little Waldingfield History Society was most pleased to welcome John Walker, one of Suffolk’s leading architectural historians, to the Parish Room on November 13th. As previously promised, John showed us how dwellings evolved during this period and what present day medieval houses would have looked like in their original form, a feat he achieved by artfully altering numerous photos, adding or removing doors, windows, rooflines and sometimes whole ends of houses from their current layouts. It was also fascinating to discover that the developments that actually happened, somewhat belatedly by up to a hundred years in East Anglia, now make perfect sense after hearing an expert speak passionately about a subject he clearly loves. 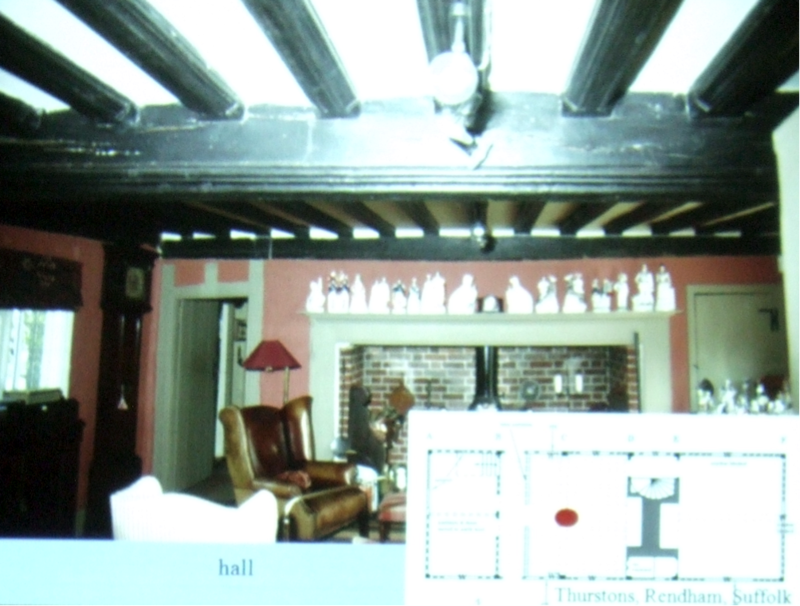 Wood was expensive in Tudor times, so as little as possible was used, giving rise to thinner timbers, changed beam layouts and half timbered houses with wattle & daub between the timbers. Fireplaces and chimneys also rapidly evolved, leading to upper floors (because smoke from the fire was now contained), whilst larger windows with small panes became popular with the rich, giving rise to the many lovely houses seen in Lavenham, Hadleigh and elsewhere today. Most interestingly to your writer, it appears there were many timber framed chimneys back then, though few survive to this day; apparently they were pretty good, though one suspects many must have burnt down over the years. Should any lucky reader have one in their house today, please try and preserve it for tomorrow and the day after! 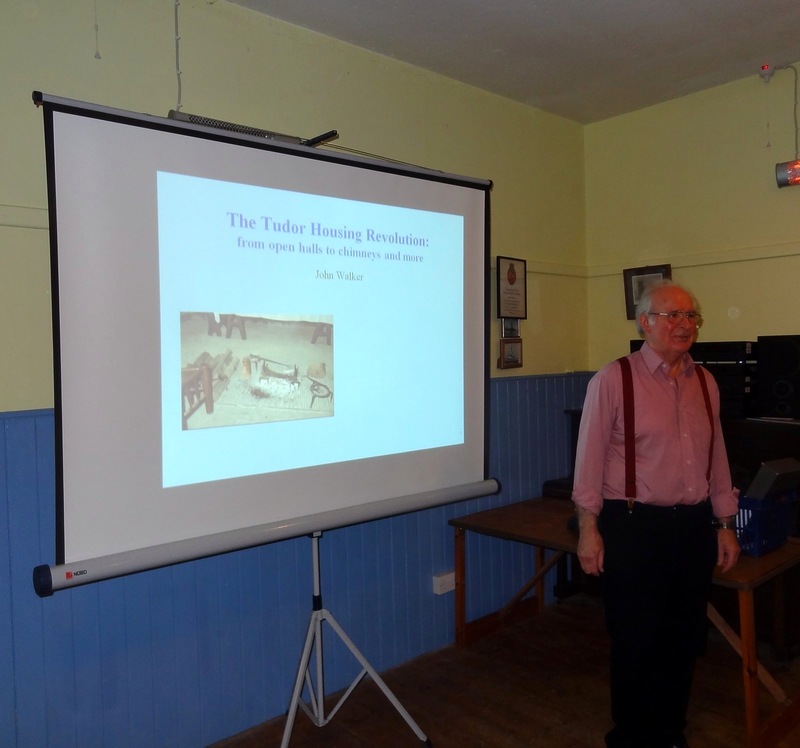 We also learned that many apparently Victorian brick built houses are actually medieval timber framed buildings with a brick outer skin, and after John’s talk, the audience will be able to work this out for themselves; its all about looking at the basic layout of houses and the positions of doors, windows and chimneys – enthralling stuff. 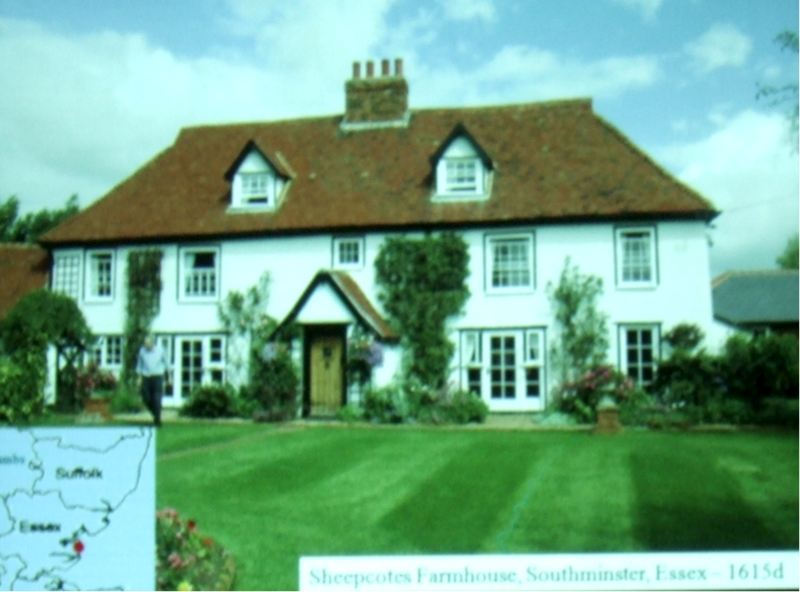 Our next talk is on December 11th, when we are absolutely delighted to invite Jane Gosling, an expert from the National trust, to talk on “Boom and Bust” in the Lavenham Wool Industry. In the 16th century this picturesque village was the fourteenth wealthiest town in Britain – just think about this fact for a minute – paying more tax than populous cities such as York and Lincoln. This wealth derived from the quality of its renowned blue woollen cloth, which was in great demand, and all this from a population that never exceeded 2,000, a figure that is very similar to the present day (population in 1801 was 1,776, that in 2001 was 1,750). However, by 1525 the bubble had burst. The demise of the cloth trade, for which Lavenham was rightly famed, meant that the merchants had left, looking elsewhere for their next new venture. The local population was unable to maintain the timber-framed buildings, which had previously been funded by the enormous wealth created by the trade, and the buildings began to crumble. By the 17th century there was a threat of mass demolition. The situation was so severe that the Lord of the Manor took his tenants to court to prevent the destruction. Thankfully, Lavenham has since recovered and its many glorious timber framed buildings and wonderful Guildhall remain today, making it probably the best preserved late medieval town in the country. Come and hear an expert bring Lavenham’s history to life, and then take another wander round the town to savour your new found understanding and appreciation for the things that happened in our inherited past. The service this year was rather special because, for the first time, a wreath was laid in memory of the many US airmen of the 486th Bombardment Group (H) lost during the second world war. The 486th Bomb Group were based at Sudbury airfield, on the boundaries of the three parishes of Acton, Chilton and Great Waldingfield, and were the closest air base to Little Waldingfield; US personnel frequently visited the village and of course the two pubs, for a pint or two of their “warm beer”. 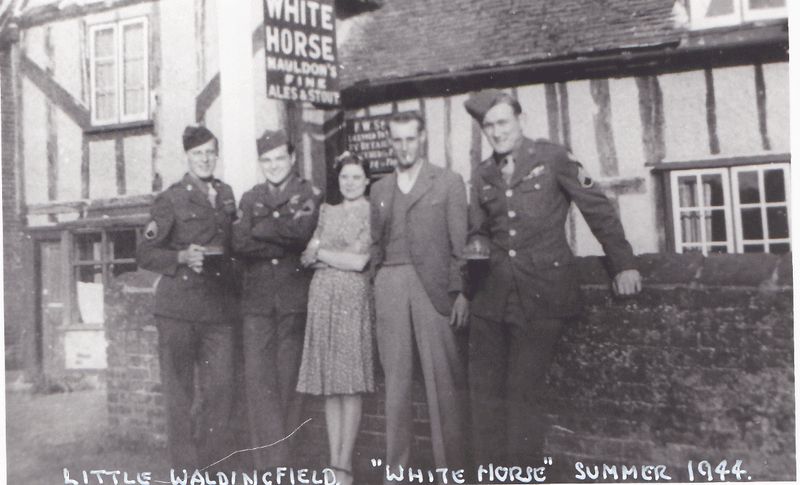 During the course of LWHS researches into the history of the village, we came across a photo of a group of US airmen standing outside the White Horse, unfortunately no longer a pub, with the land lady Mrs Olive “Coodie” Sparkes and her husband some time during 1944 / 45. By chance LWHS managed to make contact with the Sparkes family, and were delighted to discover Coodie very much alive and well at the grand age of 93. 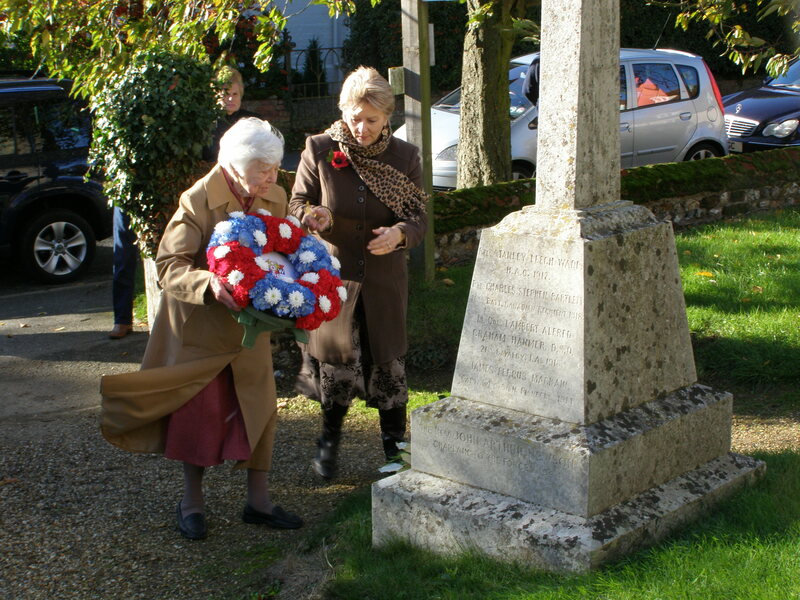 She fondly remembers the airmen, particularly George Sherlock, Frank Tysl and ML Kirkpatrick (P-40), and remained in contact long after the cessation of hostilities. 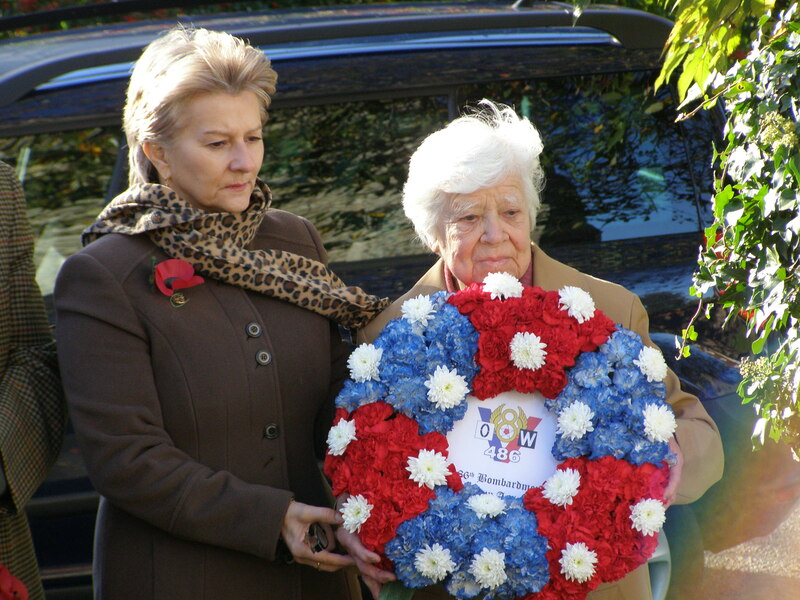 Following an LWHS interview, Coodie accepted an invitation to lay a floral tribute to the 217 US airmen of the 486th who were killed in action during their tour of operation, and all were remembered during the service on Sunday in glorious weather. 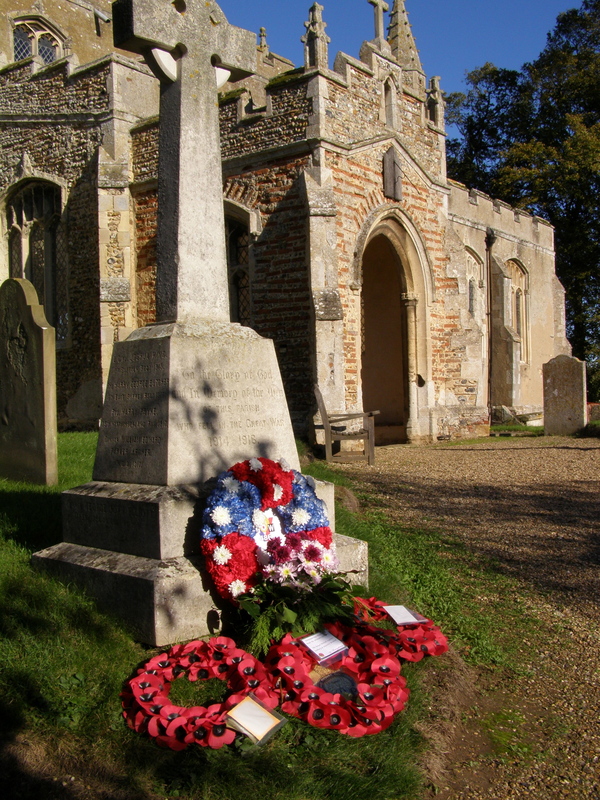 All agreed there was a real sense of occasion during the service, and if any reader would like to follow up with the 486th, please check out the Bomb Group Association website and blogs. 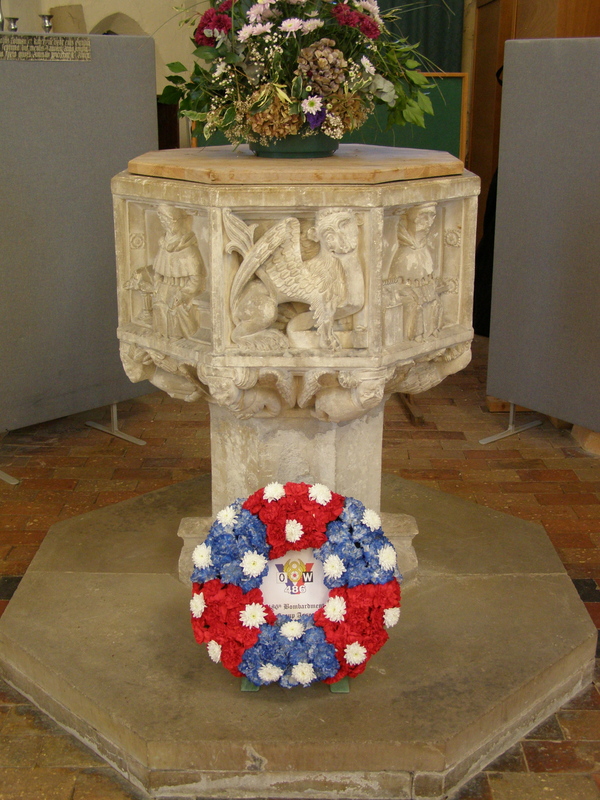 With kind thanks to Dennis Duffy, LWHS chairman, member of the 486th BGA in the UK and member of Little Waldingfield PCC, who helped with arrangements and took the photographs. LWHS are delighted to advise that we have just booked our favourite speaker, Pip Wright, to talk to us next June with a brand new presentation – Lady Alice de Breyne of Acton – we can’t wait. Between October 1412 & September 1413, Lady Alice, who was a Suffolk Noblewoman, maintained a record of all food & drink consumed in her significant medieval household more than seven hundred years ago – how cool is this. As a widow and owner of several large estates, she enjoyed greater status and influence than most married women of her time, which allowed her a remarkable degree of social and financial independence, as seen through the household account book and other records. Somehow this book survived, and Pip will talk us through the records and enthral us with his piercing insight to this far away time – its going to be brilliant. 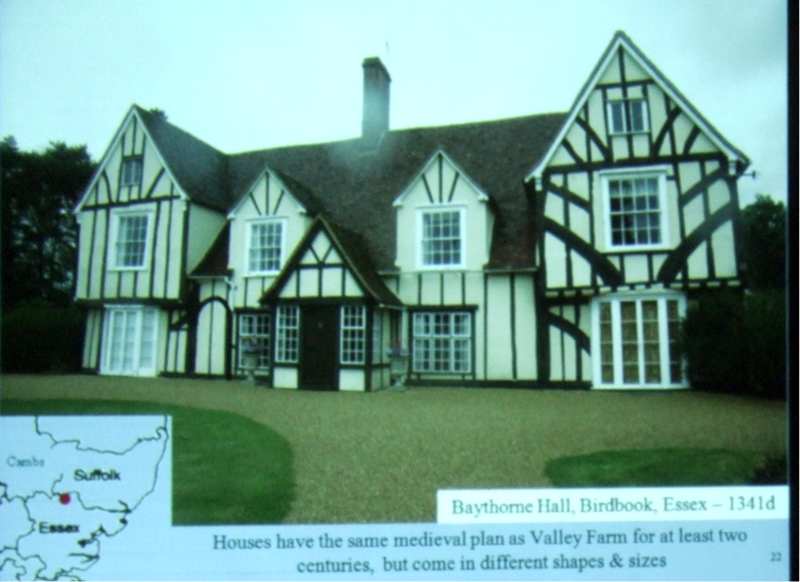 Just a week to go to our next event, at the Parish Room on Wednesday 13th November at 7.30 pm, when John Walker, a former Chairman of Essex Historic Buildings Group and one of Suffolk’s leading architectural historians, will talk to us on “The Tudor Housing Revolution”. This was one of the topics members expressed an interest in last year, and we have finally managed to pin John down! John’s presentation will show how buildings evolved during this period and what they would have looked like in their original form. Wood was expensive back then, so as little as possible was used, giving rise to half timbered houses with wattle & daub between the timbers. Fireplaces and chimneys also rapidly evolved, leading to upper floors, whilst larger windows with small panes became popular with the rich, giving rise to the many lovely houses seen in Lavenham and elsewhere today. 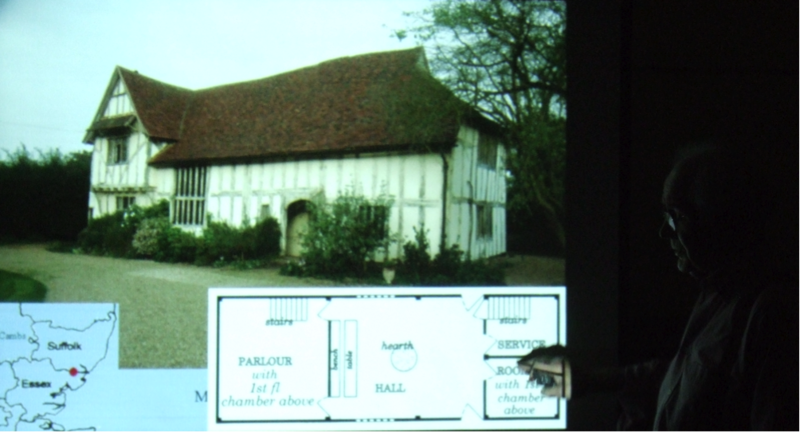 You will also learn that many Victorian brick built houses are actually medieval timber framed buildings with a brick outer skin, and hopefully after John’s talk, you will be able to work this out for yourself next time you go wandering around Lavenham or other medieval towns. We hope to see friends new and old at what should be another superb LWHS historical presentation.